"Hoppy" to see the new prizes in the daily newsletter! Enjoy and have fun doing the melody! Get ready for the Easter Bunny Melodies Hunt, Find the Invisible Easter Bunny Melodies! Throughout the kingdom, you can take part in an Easter Melody adventure! To find a special Easter prize, follow the sound of the Invisible Easter Melody. When the music is soft, you are far from your goal. When the music gets loud, louder, loudest, you are near the Invisible Easter Melody! As you wander through the kingdom, each new area you venture into will play a melody! 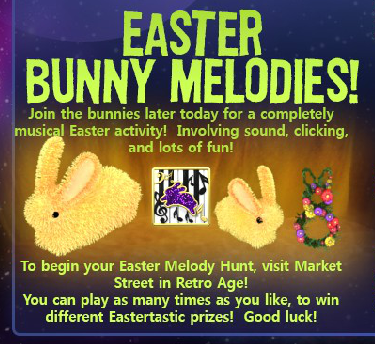 There is a special reward once you have discovered all the invisible Easter Melodies! Have fun as you seek the Invisible Easter Melodies! Note: If you ever need a reminder for the next area to visit to find a sound, you can visit Central Square for a hint! OMG I know Sunday, but a friend sent me won. But I'm going to continue trying to get it...cause well it is just to freaking cute!!! Apricot trees have popcorn for leaves, pop on over to your next Easter Melody! Congratulations! Peep! You found another Easter Melody! Baa! Baa! Baa!! Went the little spring lambs, frolicking in the meadow! Congratulations! Happy hopping to your next melody! Happy Easter! Leap! Leap! Leap! Went the bouncy little bunny! Good luck finding your next Easter Melody! Congratulations! Spring is in the air! Spread the sunshine and waddle like a duckling to your next Easter Melody! Happy Easter! Congratulations! Peep like a chick and spread the Easter cheer! Hug a bunny and send your love to someone dear this Easter near! Happy Easter! Peeptastic job, keep up the good work! Hop on to your next melody! Congratulations, you have found the Easter Melody! Bunnies hopping along a bunny trail bring lots of chocolate to all near! Flowers are pushing up their sleepy heads and welcoming the new day! Happy Easter, good luck! Little ducklings are near and spreading lots of cheer, waddle like one and spread the fun! Congratulations, you have found the Easter Melody! Peep! Peep! Peep! It's Peep Time and you've had a swell find! Congratulations! 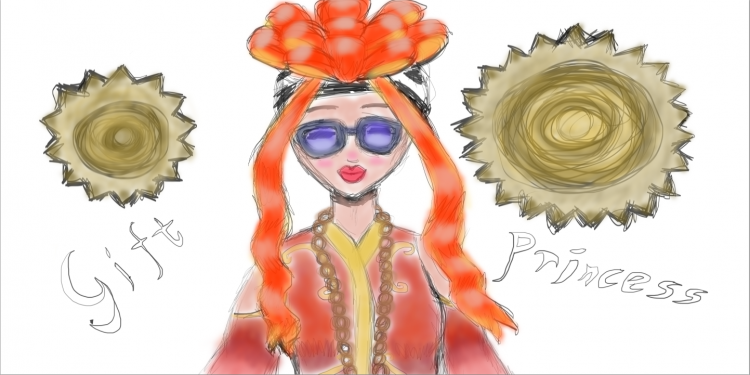 Bow! Wow! Wow! Went the playful spring puppies! They're excited you found this Easter Melody! Congratulations! Hop like a bunny to a bunny hole, in search of the next Easter Melody! Happy Easter! Meow! Meow! Meow! Went the little spring kittens, they're very proud of your find! Congratulations! Hippety Hoppety, hop onto your next melody! Congratulations! The sun is shining every day; clouds never get in the way for Easter Melody hunting! Happy Easter!